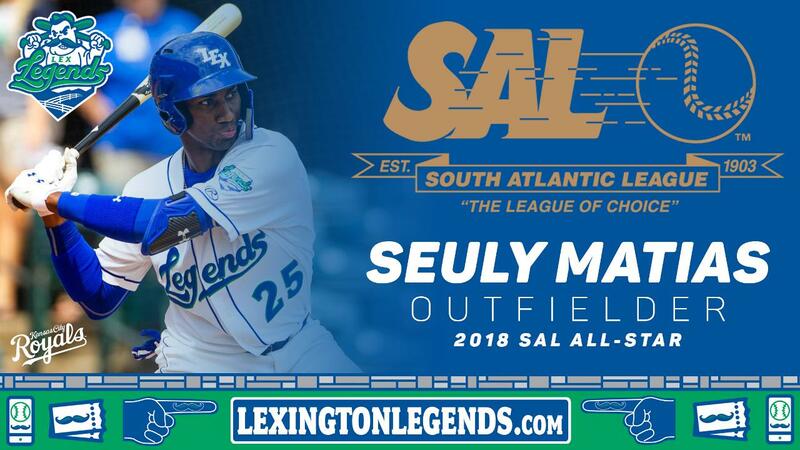 WHITAKER BANK BALLPARK (Lexington, KY) - The Lexington Legends are proud to announce today that outfielder Seuly Matias has been named to the 2018 South Atlantic League All-Star Team. "Matias has been a one-of-a-kind player from the moment that he first arrived in Lexington. He adds to a great list of prolific power hitters who have worn Legends uniforms such as Hunter Pence, J.D. Martinez, Brian Pellegrini and more. He has been so fun to watch this season and we are honored that he is our representative on the 2018 All-Star Team," said Legends President/CEO Andy Shea. Matias finishes the season with a .231 batting average and 31 home runs. He set a new franchise record in home runs in a single season. The previous record was held by Brian Pellegrini set in 2008. Matias doubled 13 times and had one triple as well while driving in 63 runs. He had 19 multi-hit games including 17 with two hits and two with three-hits. The Legends are currently in the playoff hunt are in first place in the Southern Division, 2.0 games ahead of the Greenville Drive. Playoff tickets are now on sale! 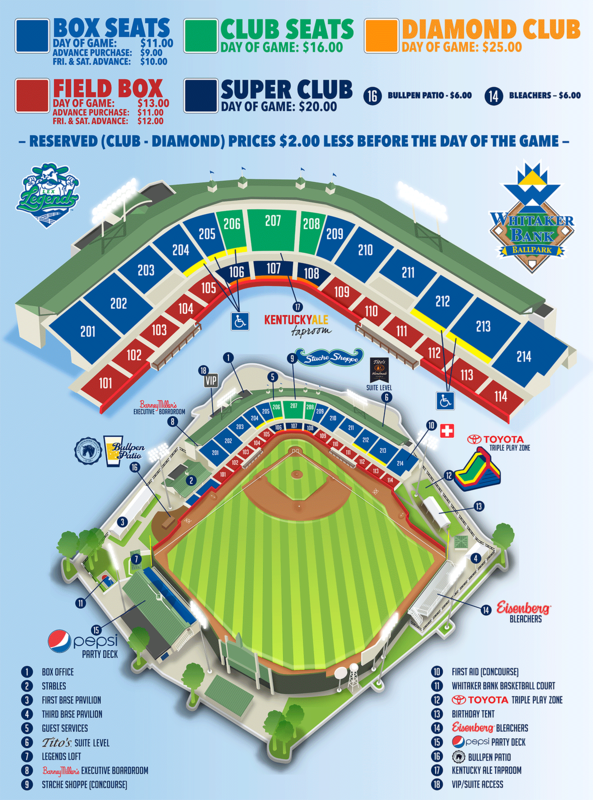 Prices range from $24 Box Seats to $66 Diamond Club seats for all three games which are slated for September 5, 11 and 12. All purchases are final. Any games not played or if the Legends are eliminated from the playoffs, accounts will be credited for 2019 tickets and ticket packages. Clearwater, Florida-Eric Krupa, President of the South Atlantic League, announced the selection of the 2018 Annual All-Star Team. The All-Star Team was voted on by the 14 South Atlantic League Team's Field Managers, General Managers, Sports Writers and Broadcasters for a total of 56 votes. The Annual All-Star Team was highlighted by the selections for Most Outstanding Pitcher, Most Outstanding Major League Prospect and Most Valuable Player. Denyi Reyes of the Greenville Drive was selected as the Most Outstanding Pitcher. Reyes has a 10-3 record and an ERA of 1.89 over 123 2/3 innings in 21 games. Oneil Cruz from the West Virginia Power was named the Most Outstanding Major League Prospect. Casey Golden of the Asheville Tourists was chosen as the Most Valuable Player. Golden is leading the league in home runs (32), RBIs (90), runs scored (86), extra-base hits (57) and total bases (246). Marty Malloy of the Lakewood BlueClaws has been selected as Manager of the 2018 Annual All-Star Team. Lakewood pitching coach Brad Bergesen was chosen to be the Coach of the 2018 Annual All-Star team. The Asheville Tourists had three players named to the Annual All-Star Team, including Chad Spanberger (first base), Bret Boswell (second base) and Casey Golden (outfielder and Most Valuable Player). The Delmarva Shorebirds, Lakewood BlueClaws, Rome Braves and West Virginia Power each had two players named to the team. Delmarva provided Jean Carlos Encarnacion (third base) and Zach Jarrett (utility outfielder), Lakewood provided Will Stewart (left-handed pitcher) and Jake Scheiner (utility infielder), Rome contributed William Contreras (catcher) and Drew Waters (outfielder) and West Virginia provided Oneil Cruz (shortstop and Most Outstanding Major League Prospect) and Calvin Mitchell (designated hitter). The Greenville Drive, Hickory Crawdads and Lexington Legends each placed one player on the team. Greenville's Denyi Reyes (right-handed pitcher and Most Outstanding Pitcher), Hickory's Demarcus Evans (relief pitcher) and Lexington's Seuly Matias (outfielder) complete the 2018 All-Star lineup.